History: A history is likely to elicit the presence of pain, numbness, tingling, bowel or bladder dysfunction, and leg weakness. Physical examination: Cutaneous markers, weakness, long tract signs, reflexes, and sphincter tone should be noted. Urinalysis: Urinary analysis may be helpful in the presence of fevers or if a urinary tract infection is suspected. Ultrasound: An ultrasound of the spine can be done when the child is younger than 6 months as a screening to determine the level of the conus. Movement (or lack thereof) of the conus can also be evaluated as a sign for potential tethering. CT of spine should be performed if bony anomalies are present. A CT myelogram may be helpful if MRI is unavailable. A bony spicule in the split cord may be visualized. 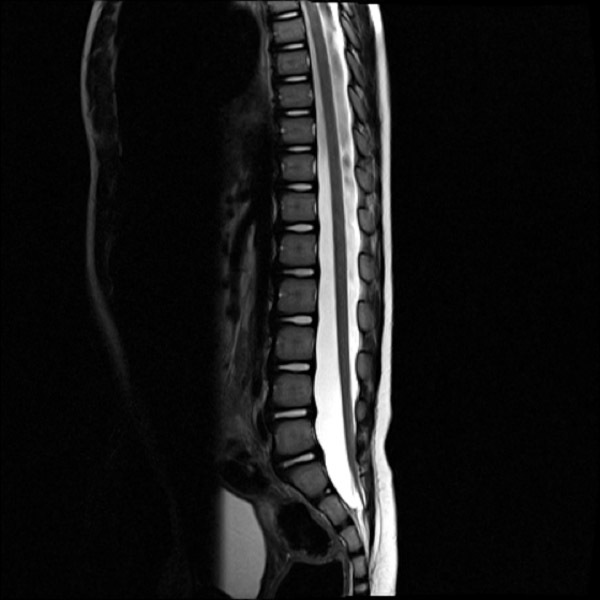 MRI is the study of choice to evaluate the position of the conus and the pertinent surgical anatomy. Prone MRI may help differentiate if the cord is tethered or not. The cord would normally be expected to fall ventrally with gravity when the body is in the prone position unless the cord is tethered. No change in the dorsal ventral cord position suggests a tethered cord. 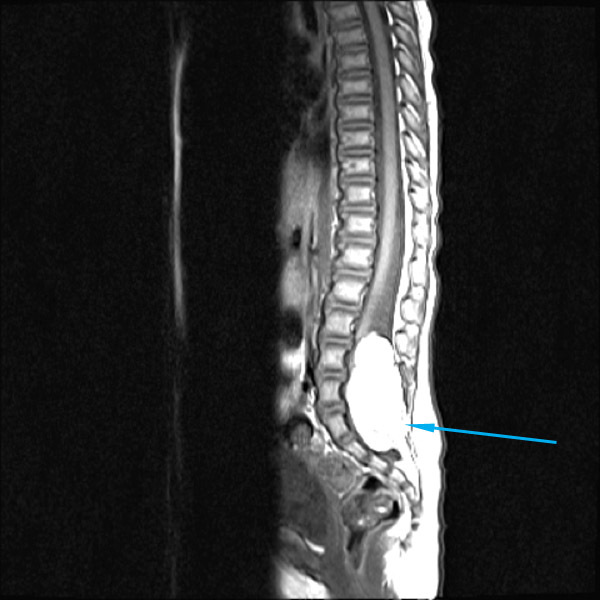 T1-weighted MRI of spinal cord tethered by a lipomyelomeningocele: Shown is the spinal cord with an intradural lipoma leaving its dorsal surface at L2-3. No nuclear medicine tests are used. Urological assessment: Urodynamic studies may be needed if there are bowel/bladder issues. EMG study of the bladder may be used to measure detrusor muscle activity during voiding. This aids in the diagnosis of detrusor-sphincter dys-synergy. Disadvantages are expense and discomfort. No neuropsychological tests are indicated. Physical examination, urodynamic testing, and imaging: A complete examination including urodynamic and radiographic evaluations should be taken into consideration when developing a provisional diagnosis. The presence of progressive lower extremity weakness along with radiological suggestion of a tethered cord should be rapidly evaluated and consideration given to surgery.